It’s a small dwelling that was put together in fits and starts, bits added as the original owners decided they could afford it. It’s quaint, every room is on a different level and the rooms are small, but it is so perfectly idiosyncratic and the place just spoke to us when it was put up for sale 31 years ago by the original owner. We renovated six years ago and opted to remove the old wood-heater because we knew that in our old age, the last thing we wanted to be doing was carting wood and dealing with the ash, dust and mess that is a wood-burner, despite the obvious charm of flame and wood. Writing can be so demanding that it swallows one whole. It’s a double life. One has mistresses, lovers, enemies and friends that no member of the family has any idea about. A secret life…I tell you, spooks and MI 6 have nothing on a writer. We all chase dreams. Some more than others. But the writing dream is one that comes with its own issues. In this honest and revealing post, Gordon Doherty, writer of spectacular Roman and Byzantine fiction explains how the profession of writing really tested him! At last this wonderful anthology is available. 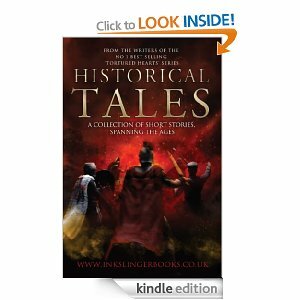 When I joined Inkslingers, I never thought I would be contributing two hist.fict stories to an anthology. How does one write a meaningful short-story that is historical fiction? So I sat and played with words and two stories emerged to creep into this anthology. So did some astonishing tales by others.